Elbow drops, suplexes and moonsaults are some of the moves you can expect to be thrown at you by Beat the Champ. Beat The Champ is the 15th studio album to come out from The Mountain Goats and embarks on a journey through professional wrestling and fatherless homes. You would think that The Mountain Goats would be tired after 15 albums, but they still sound almost as youthful as when they started in 1994. “Heel Turn 2” The vocals and the guitars come at a relaxed pace and help capture the sadness of the song. “I don’t want to die in here.” is crooned out by John Darnielle as the song goes on. Darnielle changes things up in the song with the implementation of the piano. The piano provides a gloomy ending to a song full of despair and leaves you said waiting for your favorite hero to get up and fight another round. “Choked Out” is a song with a fairly clear message which is getting choked out during a match. The song is sporadic much like the duration of a wrestling match with the guitars and drums grappling it out for the top position of sound. The vocals come across as hectic and rapid and really capture the heat of the moment of the wrestling match that is occurring. “The Legend of Chavo Guerrero” comes off as a ballad and cuts away from more of the faster paced material off of Beat the Champs. The song works in telling the story of Chavo Guerrero Sr. who was known as Chavo Classic as a part of the World Wrestling Federation. The song has a bouncy acoustic guitar with a southern rock flair and pairs well with Darnielle’s soft voice. 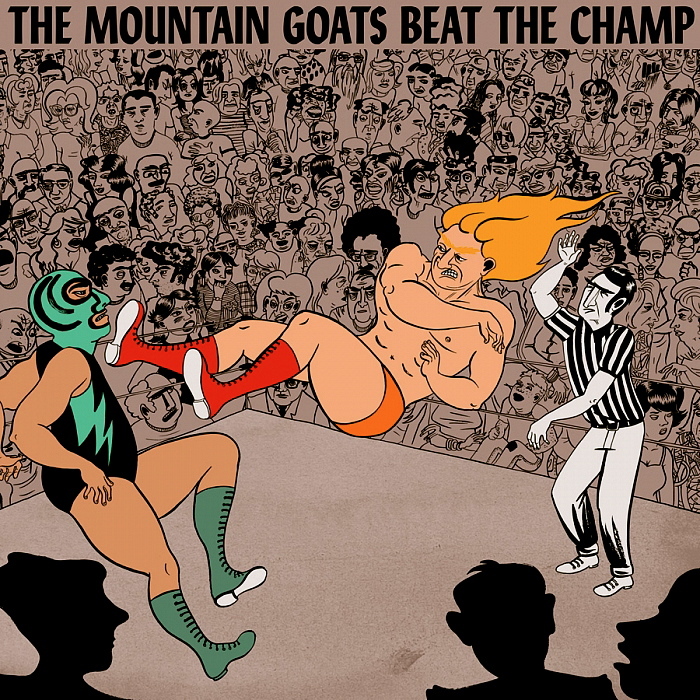 The Mountain Goats bring us back to a simple time in life when the worst foes were the ones flying off of the top rope. Just taking professional wrestling and alluding it to life is fairly difficult, but Darnielle accomplishes this through his creation of smart lyrics. Darnielle paints us a vivid story about wrestling through his lyrics and provides the backdrop through the exuberant instrumentals. Beat The Champ proves how strong Darnielle is as a lyricist and provides an extremely strong style of storytelling through professional wrestling. Next VOTE FOR YOUR SPRING WEEKEND OPENER!